Halloween has to be the best “holiday” of the year. Don’t get me wrong; Christmas is cool, Thanksgiving is fun, but Halloween is a free pass to go nuts. Whether you’re one of thousands of girls who take advantage of the one day it’s socially acceptable to tramp it up, an individual who plays out his/her secret fantasy without fear of judgment (furries are people too, or so I’m told), or just someone who likes a little make-believe; this day has something for you. Halloween is the best night of the year to go out. No other day will complete strangers be so open to meet you; so willing to start random conversations. 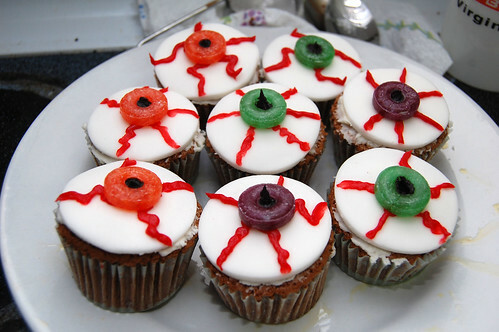 My friend Lindsey and I were talking, discussing potential works of art to bring to her party and she mentioned recently coming across “eyeball” cupcakes. Doing a quick search on foodblogsearch gave me plenty of examples. Having dabbled in fondant before (sometimes successfully), I decided to give it a shot. 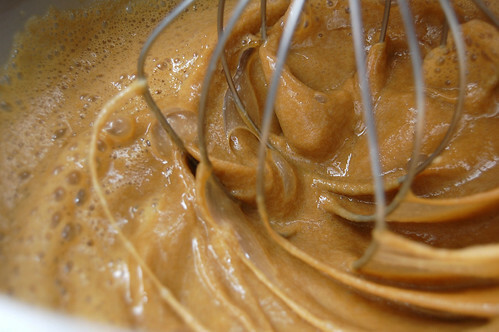 This is more of a how-to on the decorative process than it is a recipe. For the cupcakes, I used a recipe from Joy Of Cooking (also known as my bible). You could use anything. Like yellow cake? Do that. All about red velvet? Go for it. The world is your oyster (pantry). After the cupcakes have cooled, begin working on the fondant. Start with half and work it in your hands; warming it up. When it’s comfortably pliable, set it on a clean working surface to roll it out. Note, some fondant can stick to some (most?) surfaces. Not as big a deal with the small shapes we’re making here (pastry cutter for the win), but you could always dust the surface with corn starch. 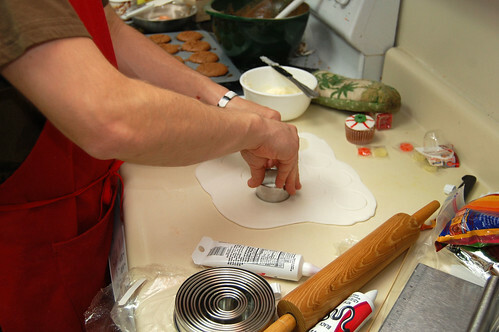 Roll out your fondant like you would a pie crust; from the center out. Feel the surface of the fondant to see how smooth and even it is. You’re going for 1/4 to 1/8 of an inch thick. This process is really forgiving since you’re going to be making really small shapes. Use a pie cutter of the proper size (or a glass or anything round) to cut the whites of the eyes for each cupcake. Spread a layer of icing on the top of each of the cupcakes. This is your glue. 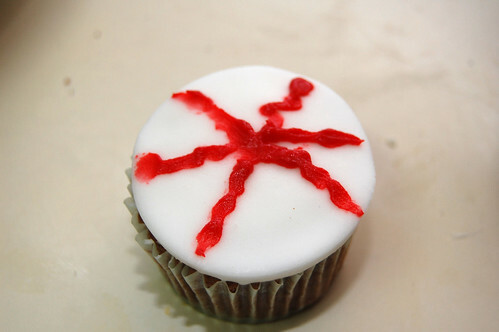 Glue your eyeball whites onto the cupcakes. Depending on your icing, it might dry somewhat quickly, becoming less awesome in the glue category. You may want to consider only icing half first, gluing on the whites, then continuing with the other half. Next, the veins with the red icing. Start from the center, drawing squiggly lines out; as many as you want. Don’t worry too much about how pretty the center is. After you’re done with this, you’ll place lifesavers at the center and dot its hole with black icing.